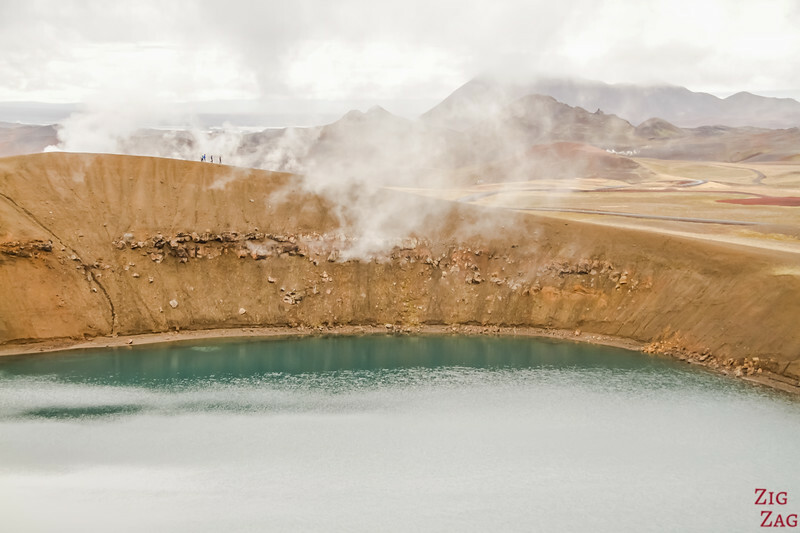 The Krafla Viti crater Iceland, located near lake Myvatn in North of the ocuntry is a circular crater filled with blue water and surrounded by a geothermal area and colorful mountains… What could you want more? This is another incredible Icelandic landscape. Where to stay near Myvatn? 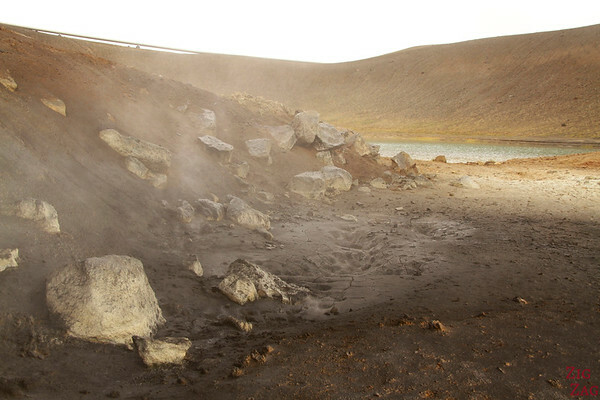 The Myvatn area has many volcanic and geothermal features. 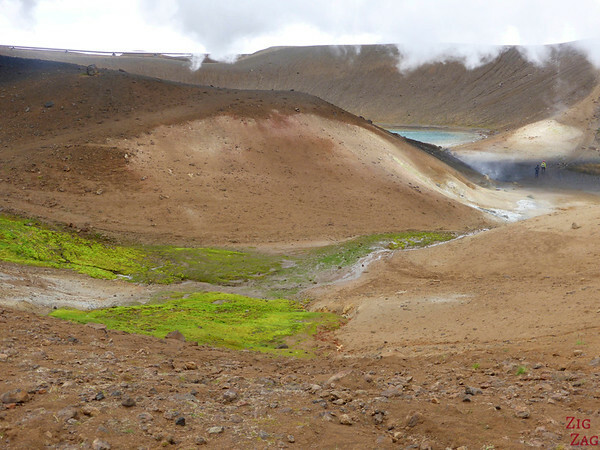 Contrary to the Hverfell crater which is very dry and dark, Viti is filled with deep blue water and colorful mountains. Another must stop in North Iceland (I know you will need a full months with all those ‘must stops’…). 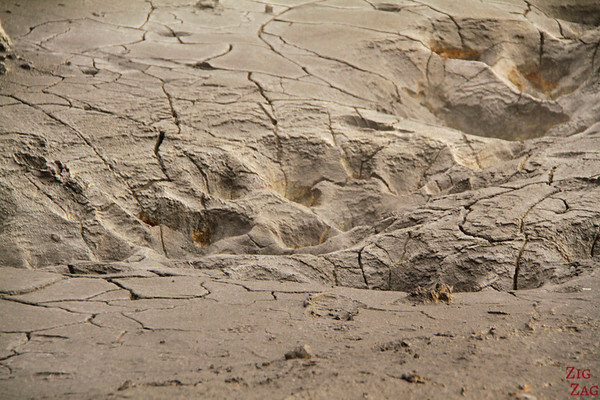 This Viti is a large crater approximately 300m in diameter whose name signifies Hell. 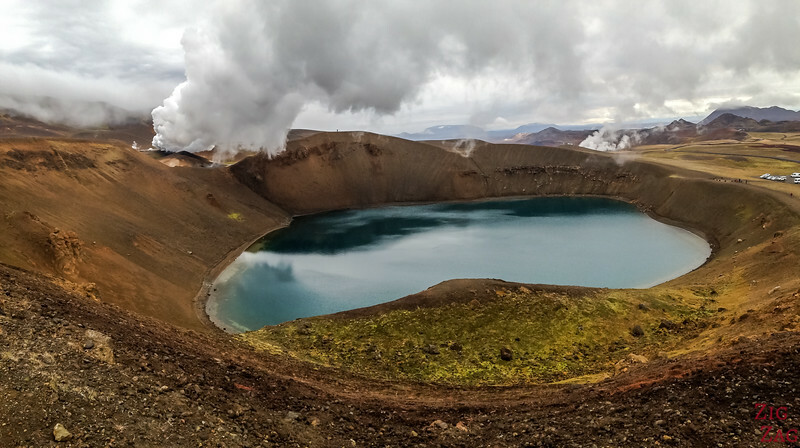 It was formed during a 5-year long explosive eruption of the west side of Krafla at the beginning of the Myvatn Fires in 1724. I visited in Autumn and it was surreal but check out some crazy photos of it in the snow. From the carpark the half on the right side is easier. I found the left side slippery and difficult even in dry conditions. I think the best views of the crater are on the left side (when facing the lake from the parking) while the best views of the surrounding mountains are on the right. This location, along with many other beautiful places, is included in my eBook: The Road Trip Guide - Iceland. The area of the Viti crater is quite surreal. The water, colorful mountains and the steam hissing out of vents create an post-apocalyptic atmosphere (except for the cars parked at the end…). I took a picture of the people across to give you an idea of the depth. The ground is slippery so be careful! In the middle of the rim tour you walk down toward a small geothermal area between the 2 lakes. The surreal atmosphere continues… Stay on the path and walk on lighter brown area to avoid your shoes melting. For more information about planning a trip to the Myvatn area, including accommodation and other things to do, head to my North Iceland Travel Guide. What do you think: a must-stop for you? This location, along with many other beautiful places, is included in my eBook: Experience Iceland. We are travelling to Iceland for the first time. 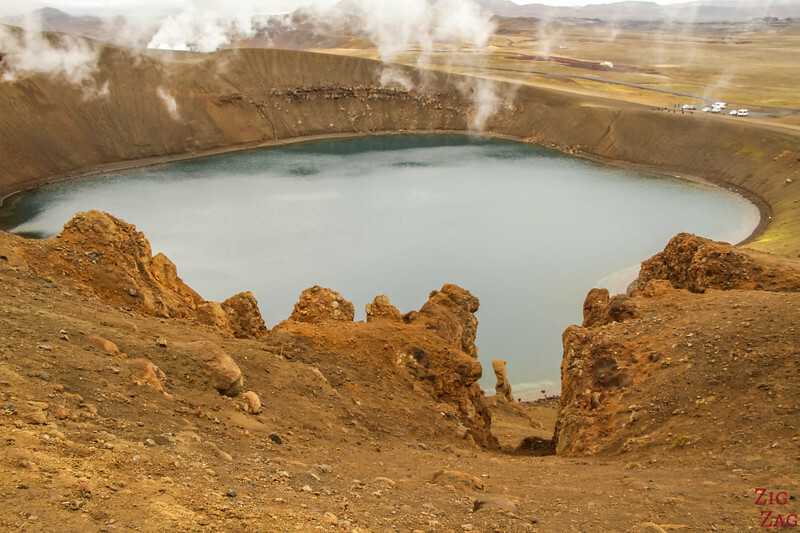 We would like to do the Krafla Viti Crater Lake – Rim Walk. Could you please let us know what is the cost involved for both of us. We will be in that area in the first week of July 2018. For the moment, almost all of Iceland’s Nature attractions remain free to access. 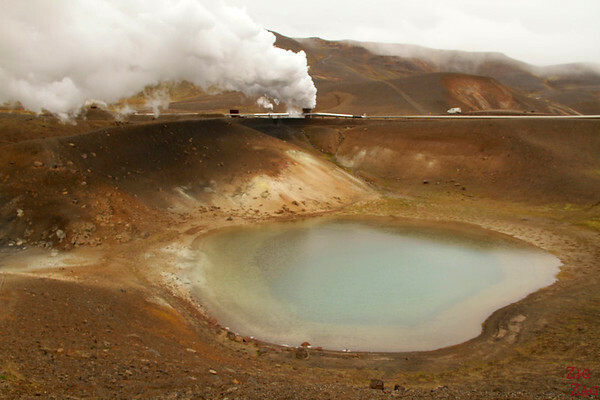 We would like to know if the carpark to Krafla Viti Crater Lake is accessible by motorhome. Are there other places we can drive to easily around myvatn lake? 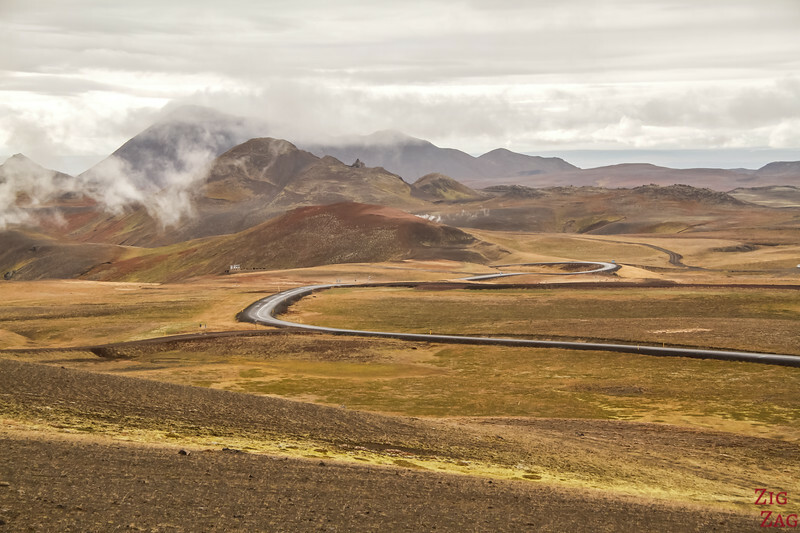 The road to Krafla is paved and good. Should be no problem. Dimmuborgir, Hofdi, pseudo-craters, Hverir… most are easily accessed. Thank you so much for your quick and complete answer ! I know now that I can plan to stay for 2 or 3 days in Myvatn to enjoy peacefully the area. Congratulations too for a your travel guide. It is clear, full of beautiful photos and good advices. Im going to iceland for 5 days in april and would like to visit the Viti crater but dont know how to get there since i dont drive. Do you know If it is possible to get a guide? 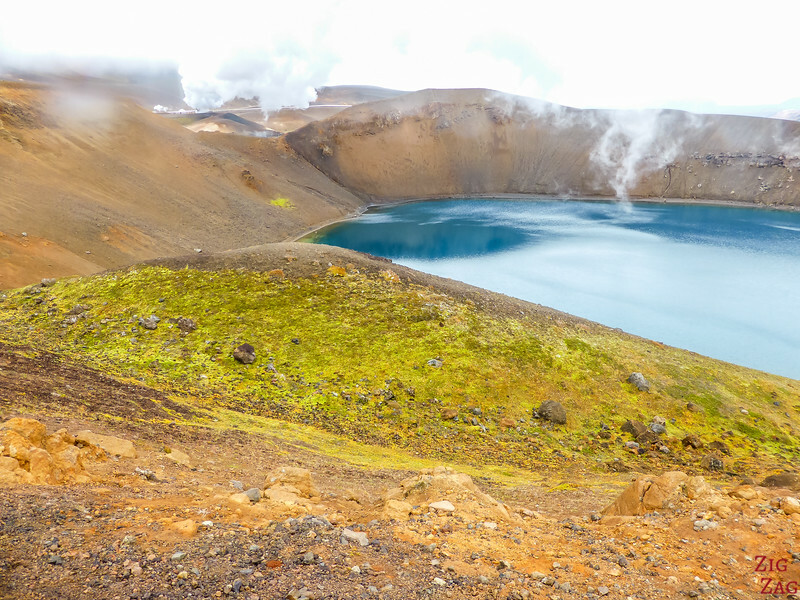 If you want to see Krafla viti (the one in this article), I don’t know of anyone that would do just that tour since I focus on road trips. Sorry.